Bachelor of Theology – Flinders University, SA. Master of Arts (Hons) – Andover Newton Theological School, MA. 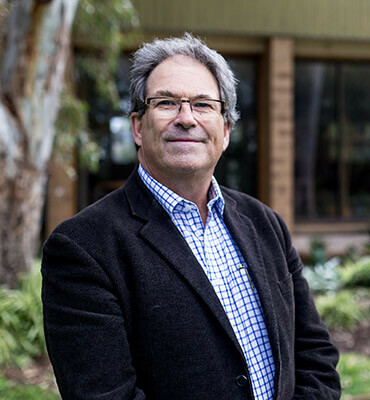 Before joining the faculty at Uniting College, Sean spent over twenty years as a Minister of the Word in congregational ministry within the Uniting Church. He enjoys bringing the richness of that experience to leadership formation through Supervised Field Education and teaching in areas related to pastoral practice. He believes that the love of knowledge and imaginative application is foundational to fruitful expressions of mission and ministry. Sean is a PhD student at Flinders University, his thesis being the importance of spiritual affections in relation to the practice of Christian ministry. Sean is somewhat eclectic. He is a reader of culture, a player of acoustic music, a writer of liturgy and an occasional writer of poetry and song. He is also a keen political observer, a life-long supporter of Essendon and coaches a Glenelg District Cricket U/16 team. Sean is married to Christine and has a blended family of five, ranging in years from 16 to 33. He has one grandson, aged 4. Eremos: Exploring Spirituality in Australia, December 2013, ‘Reaching: The Synergy of Poetry and Prayer. Words for Worship, Mediacom, SA. July-December, 2013. April-June, 2015. ‘The Promise and Perplexity of Jonathan Edwards’s Pneumatology’, Graduate Research Hour, Uniting College, SA, September 2015. ‘Paying Attention to Divine Beauty: Jonathan Edwards, spiritual practices and the forming of affective disciples.’ National Assembly of the Uniting Church Research Colloquium, Melbourne, November, 2015. ‘The Promise and Synergy of Integrative learning: Reflections on Recent Classroom Experience’, ANZATFE Biennial Conference, Melbourne, December 2015 & Revised for UCA National Educators Conference, Brisbane, 2016. ‘Theological Aesthetics and the Atonement of Christ,’ 2016 ANZATS Conference, Melbourne, 2016. ‘Why the art of Christian Ministry?’ ANZATFE Research Day, Melbourne, 2016. ‘The Teacher and Spiritual Formation’, ANZATFE Biennial Conference, Sydney, December, 2017 & revised for Graduate Research Hour, Uniting College, 2018.